I had one of my rare 3-1 nights at the club. My first game was against this guy Steve, who plays a sickly devastating closed board game, which as Alceste well knows, is the best defense against my bingo-dependent game. I lost by 155 points. Which made me sad. I was then pitted against a newbie, which made me happy because I handily crushed her with little resistence. She challenged basinets -- when I bingeod on the triple line. Grin. Hmm...I know it's good, but now that I look at it in print, I guess it does look funny. Okay, I take back my hysterical laughter inside. Then I had to play. Niki. She was my very first opponent at the club ever. She's super nice and friendly-- and I'm not just saying that because people at the club know about my blog now. But she is also very competitive. Plus, she has always beaten me. You obviously know where this story is going. I bingoed on her early - QUARTOS (seriously, how do I ever lose at Scrabble when I can play a word like quartos. Man, if it weren't for luck in Scrabble, I'd win every time.) She drew both blanks and bingoed back with serener to take the lead. I had a z in my rack (which I drew after the quartos move) and there were two places to play it two ways on a double letter square, but I didn't have an a. And then I became obsessed with getting the damn A. I musta wasted three turns trying for it, so she took an even more substantial lead, but I finally got my gitdanged A and played Azo and Za, to pull back into twenty points of her. We went on like this for a while, until she played unflat -- which I stupidly didn't challenge -- and jumped out to a 36 point lead. I had saiines on my rack, in the end game. There was an open t on th etriple line at the bottom, so I played off one of my i's knowing that I could bingo with whatever I drew next. But I hadn't been tracking and there were NO TILES LEFT IN THE BAG. Muzzerfocker. Now I had six tiles left, she used the T to play total and I was down by 33, with no possibility to bingo out. Instead, I sat there pouting for five minutes until I decided to add ise to total and hit the triple on the other side with totalise, for 24 points. She laughed at my desperation play AND CHALLENGED! IT WAS GOOD! And it turns out I miscalculated and the play was actually worth 27 points! Now I was within 6 -- and she lost a turn. All I had to do now was go out and I could win! And i said so. Out loud. "I know what you have, you can't go out," fired back. I stared at my remaining tiles of san. And pretty much as soon as she finished that sentence I saw the open w.
And I played swan. And I won. BY 3 points. SO SICK. My last game was against a charming British fellow. The first time we played, he was just off the boat and still playing sowpods words, so I won just by challenging them off. But he's a very very good player, so I was not looking forward to playing him now that he'd gotten the hang of OWL. Crap...thought I had a picture. Anyway, I did one of my cute sandwich played where I played faith right under his word, making like six words for 40 points. He came back with sick sandwich move of his own -- under that! Then I bingoed with sextain, but I had been fishing for it for a while, so he had a 100 point lead on me, so that barely brought me back...I bingoed again with triages to take the lead. 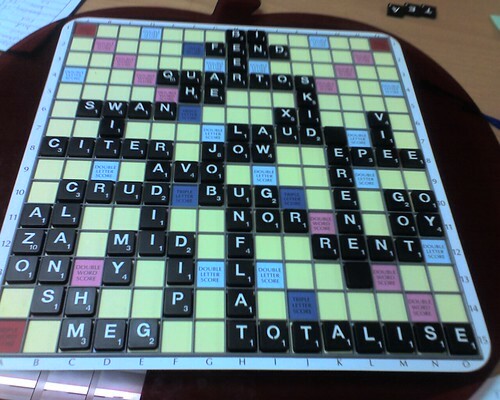 In the last play of the game he bingoed with renotice through a c on the triple line, putting him ahead by 16 points. I was all...crap. And was about to cry, when he was like "um...it's the last play, if I were you I'd challenge." "Oh yeah....challenge," I said sheepishly. I went out and won the game pretty handily. Glance complicated to far added agreeable from you! However, how could we keep in touch? I'm curious to find out what blog platform you happen to be using? I'm experiencing some small security issues with my latest site and I'd like to find something more safeguarded. Do you have any solutions? I used to be recommended this blog by means of my cousin. I'm no longer certain whether this submit is written via him as nobody else know such detailed approximately my trouble. You are amazing! Thanks! Thanks to my father who informed me concerning this weblog, this website is actually amazing. approximately all vital infos. I'd like to peer extra posts like this . Hi, Neat post. There's a problem together with your website in internet explorer, would test this? IE still is the marketplace chief and a huge component to other people will leave out your fantastic writing due to this problem. Do you've any? Please permit me realize in order that I could subscribe. Thanks. Hi there mates, nice post and fastidious arguments commented here, I am genuinely enjoying by these. to be mindful of. I say to you, I definitely get irked while other people think about issues that they just do not know about. Definitely imagine that that you said. Your favourite reason appeared to be at the net the simplest thing to be mindful of. and coverage! Keep up the amazing works guys I've included you guys to my own blogroll. am going to revisit once again since I bookmarked it. What's up friends, pleasant paragraph and nice urging commented here, I am genuinely enjoying by these. communicated in the post I read. And on this post "I love this game". have a few questions for you if it's okay. Is it simply me or do some of these remarks come across as if they are left by brain dead folks? :-P And, if you are writing at other social sites, I would like to keep up with you. Could you list all of your community sites like your Facebook page, twitter feed, or linkedin profile? my own blog soon but I'm having a difficult time deciding between BlogEngine/Wordpress/B2evolution and Drupal. The reason I ask is because your layout seems different then most blogs and I'm looking for something completely unique. I'm now not certain where you are getting your information, but good topic. I must spend a while learning more or understanding more. Thanks for great info I used to be on the lookout for this information for my mission. usage of? Can I am getting your associate link in your host? Thank you, I have just been looking for information approximately this topic for ages and yours is the best I've came upon so far. However, what about the bottom line? Are you sure in regards to the source? What's up, I log on to your blogs regularly. Your humoristic style is witty, keep up the good work! What i don't understood is in truth how you are no longer really a lot more smartly-appreciated than you might be now. You're very intelligent. it from a lot of numerous angles. Its like men and women don't seem to be fascinated unless it's something to do with Girl gaga! to go back the desire?.I'm attempting to in finding things to improve my site!I guess its adequate to make use of some of your ideas!! Yes! Finally someone writes about Eco Sanctuary. you book marked to check out new things in your website. It's really a cool and helpful piece of information. I am glad that you just shared this useful information with us. Please stay us up to date like this. Thank you for sharing. Good way of explaining, and nice post to get facts about my presentation topic, which i am going to convey in university.